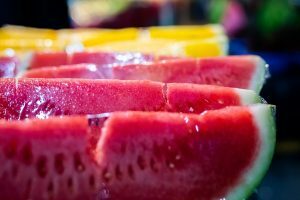 To create seedless watermelons, young watermelon plants are treated with colchicine. This causes the eggs in the flowers to develop with two sets of chromosomes (2n), instead of one. When the eggs are pollinated, they create triploid cells (because 2n + 1n = 3n). These cells are capable of maturing into fruit, but the seeds in that fruit are not genetically viable – so they can’t be fertilized and develop the hard, black testa.